A breakthrough technology that supplies the benefits of a $4,000 water ionizer in a dissolvable tablet. Serving size 1-2 tablets daily (dissolves in water)Each tablet contains: Proprietary Ionic Hydrogen Matrix Comprised of: [Maltose, Malic Acid, Magnesium, Magnesium (Magnesium oxide), Magnesium (Magnesium malate), Fumaric acid] . We developed I LOVE H2 a way to super-charge your water with Molecular Hydrogen or H2. 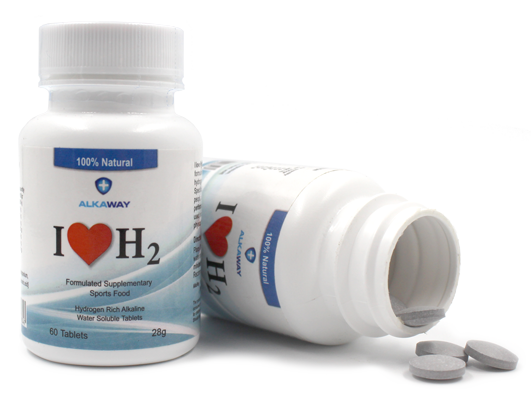 I Love H2 is a unique patent-pending formula that converts regular water to hydrogen infused water, developed in the USA in conjunction with AlkaWay. Fill the bottle with purified water. Wait for 5-20m to allow H2 to concentrate in the bottle. This gives H2 levels far better than electric ionizers. Drink all the bottle. We find one shot is far more effective than sipping. Proven sports support through scientific studies showing a reduced lactic acid effect and post-workout fatigue. Creates H2 levels of around 1.5 ppm, 3 times the normal output of a high-end electronic water ionizer.